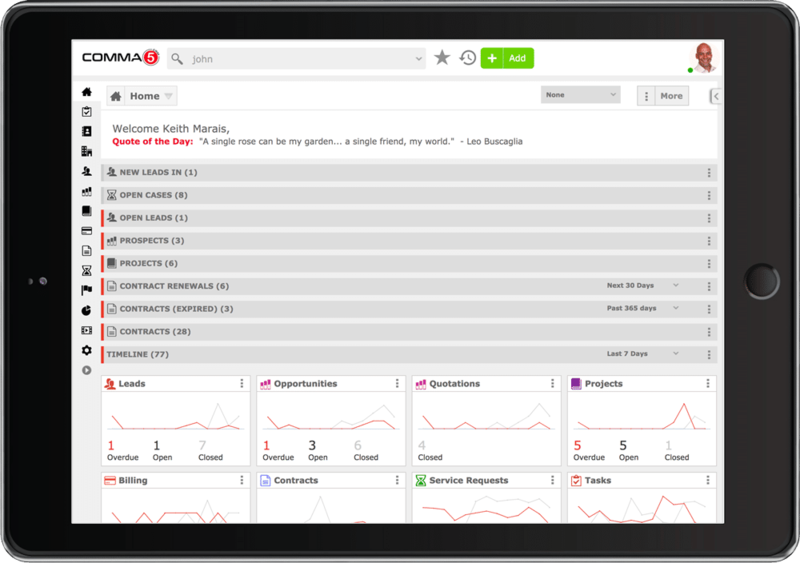 Comma5 CRM | Customer Relationship Management Software. Centralise your contact data. Everything in one place, secure & easy to find with full customer segmentation. Improve sales by managing leads through to orders, quickly creating quotations and sales orders. Track any inbound customer requests or jobs through to completion. Comma5 CRM will help you. We’ve assisted many small-medium sized organisations with the digitizing and automation of their sales and customer service processes using CRM. An Improved customer experience (CX) results in improved retention of existing customers and acquisition of future ones – both being important in growing any business. Try Comma5 CRM free. Securely store and access your data in the cloud from anywhere. Excellent value includes online help and support services. No training needed and we're here to help you anytime. We'll customise your CRM to suite your needs. Start with the apps you need and add as you grow. Tasks, Leads, Quotes, Orders, Service Requests and more. Still using spreadsheets to manage your sales or customer service processes? There is a better way.